When teeth are not aligned and spaced correctly, it can pose a threat to both the appearance and function of your smile. Orthodontics represents a special form of dentistry that involves customized treatments to straighten teeth. 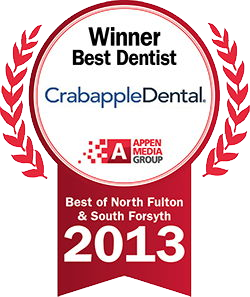 While many dental practices are forced to refer patients outside of their main office for orthodontics, Crabapple Dental is pleased to offer a full menu of smile straightening treatments right here in our Alpharetta office. In the same place that you get your routine cleanings and restorative dental treatments, you can also take advantage of traditional braces, Invisalign, Six Month Smiles and other proven solutions to straighten your smile. Dr. Sarah Roberts is an esteemed cosmetic dentist who has undergone extensive training in orthodontics. She understands the balance of science and artistry it takes to create a straight, beautiful and confident smile at any stage of life. 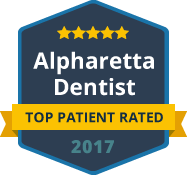 Our Alpharetta practice is pleased to offer traditional braces as well as some of the most preferred options in clear and short-term orthodontics. Whether you suffer from crowded teeth, a bad bite or large spacing between your teeth, we can help you attain the straight smile you are looking for. Traditional metal braces are the most time-tested orthodontic treatment option available. They involve a set of fixed brackets, wires and bands that are placed on the front of the teeth to gradually move your smile into ideal alignment. Dr. Roberts is equipped to care for your entire treatment in braces, including placing your brackets as well as strategically adjusting them along the way. The length of time you are in braces is based on the severity of your orthodontic concerns, but you can always trust us to make your experience comfortable and rewarding regardless of how long it takes. For teens and adults who are unwilling to wear traditional braces and want the most discreet form of orthodontics, Invisalign may be the answer. This clear, removable aligner therapy is highly conducive to your lifestyle and self-esteem, and it is proven effective for several types of orthodontic issues. Six Month Smiles ranks at the top of the list for short-term orthodontics. If you want to close a large tooth gap or straighten your crooked teeth with minimal treatment time, Six Month Smiles can be an excellent choice. Dr. Roberts has helped countless patients achieve the balanced smile they desire without undergoing years in metal braces. To learn more about our modern orthodontic treatment options for teens and adults at Crabapple Dental, please contact our practice today. We can maximize convenience and comfort with our ability to care for every aspect of your smile in one place.